Safely and easily prune tall trees with the A.M. Leonard 15' Manual Tree Pruner with Saw or Nip. 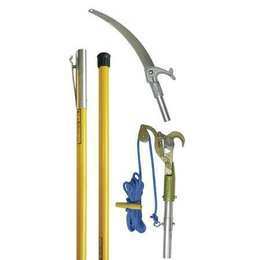 This tree pruner gives you the ability to safely and easily prune tall bushes and trees. Designed to be robust and user friendly, the A.M. Leonard Tree Pruner enables the user to work safely from the ground with no need for platforms and ladders. It is the ideal tool for pruning hard-to-reach areas. This pruner has a 15-foot reach; the saw and nip rent separately.